One of the most effective ways to reach your nutrition related goals is to be prepared. One effective method includes making sandwich bags filled with about 6 oz. of a mixture of vegetables. To increase the nutrient content, add some protein, and increase the absorption of the fat soluble micronutrients, dip the vegetables in hummus. If you do not enjoy hummus try a Greek yogurt dressing such as Bolthouse. It does not offer the same nutrient density but if it will help you increase your vegetable intake it is perfectly acceptable. Even if hummus is very palatable to you, you can still try some of the different yogurt style dressing to include a variety of flavors at snack time. It is common to feel hungry in between lunch and dinner and often times undesirable food choices are made during this block of time. These snacks are perfect to have on hand in between meals because they are low in calories and yet high in nutrients. This decreases the likelihood of making a trip to the vending machine or going through the drive through on the way home. 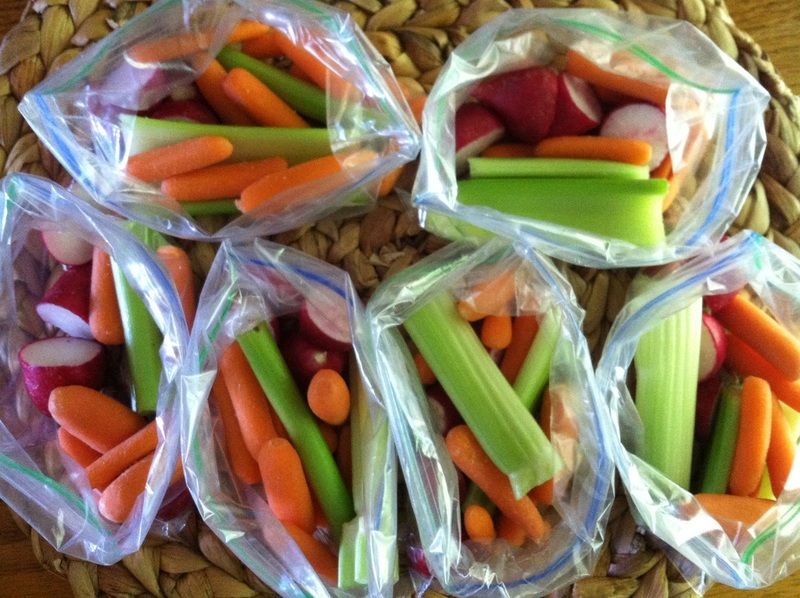 Choose 2 to 3 of your favorite vegetable each week and prepare as many sandwich bags as you need. Some vegetables that store well in the bags include celery, carrots, radishes, broccoli, cauliflower, and grape tomatoes. Cucumbers taste great with hummus but they do not store well cut up. If you want to include cucumbers in this snack try buying the pickling cucumbers, which are much smaller, and cut them up right before you eat them. Try rotating the vegetables each week for new tastes and nutrients.